Built on the ruins of the ancient city of Kalamydi, Paleochora (Παλαιόχωρα) is, as the locals say, "the bride of the Libyan Sea." This small town located on a small peninsula on the south-western coast of Crete is located 77 km south of the city of Chania. According to data from the 2001 census, 2,213 permanent residents inhabited Paleochora, who currently live mainly in tourism or agriculture, because this region is famous for growing tomatoes, unusual olives and olive oil. The mild Mediterranean climate and high average annual temperature (above 20 degrees C) make this area one of the warmest in Greece. Paleochora itself is a quite well-organized tourist town with a beautiful large sandy beach. There is a large number of small family hotels, guest houses, taverns and bars, which are visited every year by tourists who like to build their own holidays. Paleochora is still bypassed by larger travel agencies. This independence from organized tourism is evident especially in the evening at the beach, which does not wipe out at the end of the day. Nobody rushes here for dinner in a hotel, so many people like to spend their evenings on the beach. The infrastructure useful for tourists, which is here, it is worth to mention the post office, banks with ATMs and a small number of stores (including a larger market). Undoubtedly, the biggest advantage of Paleochory are ferry connections, which make this place a great base for hiking trips in the surrounding mountains and ravines (including Samaria). It is also important that the city is on the line of the long-distance hiking trail E4. There are also KTEL buses that connect the town with Chania and other smaller towns. The story of Paleochor could be started with the words: long ago in a time when there was nothing ... and it would be an accurate comparison, because in the distant history there was not even the peninsula on which this place is currently located. There was only a small hill above the water, on which the Venetians later built the Selino fort. Only the strong earthquake that struck western Crete caused the peninsula to emerge from the sea waves. The ancient Cretans built nearby the small town of Kalamyde, which probably served as the port of ancient Kandanos, and its significant role fell in the Doric-Roman period. The strategic significance of this place was appreciated by the Venetians, who in 1278 brought Castel Selino on the hill. However, his story confirms the turbulent history of Crete and the legendary stubbornness of its inhabitants in the fight against the invaders. Only a few decades after completion of construction, in 1322, the fortress was destroyed by rebels led by Vardas Kallergis. The Venetians, however, did not give up and a few years after the first defeat rebuilt the fortifications. In 1539, the fortress in ruins was changed by the famous pirate Barbarossa. It was only after 56 years that it was rebuilt, so that in 1595 it again proudly stood above the city. In 1653 Selino was occupied by the Turks, who ruled this place until the liberation of Crete from the Turkish yoke. In 1834, the British traveler Robert Pashley went to this area, but he only found the ruins of the former fortress. The area of ​​the current Paleochora once again fell in blood during the Second World War, when after the occupation of Crete by the Germans it became a battlefield and the place of action of the resistance movement. Today, only the poorly preserved ruins of Selino rising above the modern city remind us of the dark past. It is worth coming here, above all, for a beautiful panorama of the city against the background of mountains and the sea which is shown to the eyes of tourists. In addition to visiting the remains of Castel Selino, towering over the Paleochora, it is worth remembering that it is a charming town, which should be given some attention by walking its streets. Eye-catching picturesque buildings, excellent taverns create a nice photogenic mix, ktrice is worth to capture on the pictures. In your plans you must also take a coastal walk along the eastern part of the peninsula and the sunset, which is perfectly visible from the west sandy beach. If you would like to have a really long hiking trip, you can try to pass a part of the E4 route connecting Paleochora with Elafonissi. However, when preparing for it, keep in mind that the distance between the two places is really long, which is important especially if you would like to walk this route on both sides. For ease of one way, you can take a small cruise boat. A much shorter walk is an eastbound trip to the village of Anidri, where there is the charming little church of Agios Georgios, in which there are amazing frescos from 1323. It is also worth going through the same gorge connecting the village with the beach. When planning a vacation (or part of it) in Paleochore it is worth remembering that it is a good transport connection. There are both KTEL buses and a ferry that connects Paleochora with Sougia, Agia Roumeli, Loutro, Chora Sfakion and the island of Gavdos. There are also car and bike rentals on site, so you can plan some further escapades. It is also worth mentioning that in Paleochory you can find great taverns offering Cretan dishes at fairly affordable prices. We recommend that you look at taverns located a little deeper in the thicket of streets of this town. Premises located near the sea will usually be slightly more expensive, and the food can be a bit more "touristy" and devoid of real local flavor. Wandering through the streets of Paleochory, it's worth visiting the local bakeries offering the most varied salty and sweet pastries based on filo or French pastry, as well as ordinary greengrocers where you can buy delicious dried salt olives, which are local specialties. Wspaniale opisaliście Palaiochore. Cudowne i spokojne miejsce.Pozdrawiam i życzę Wam udanego pobytu na Krecie. Milia is an authentic mountain settlement, which most probably dates from about the seventeenth century. A small wooden signpost pointing to Milia may not be a great incentive to visit this place. 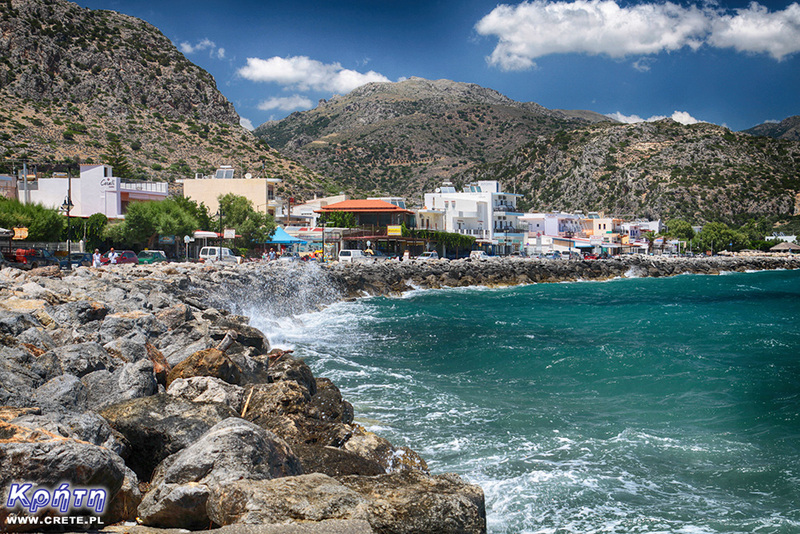 It's a shame because Milia is one of the most charming and surprising places in Crete.